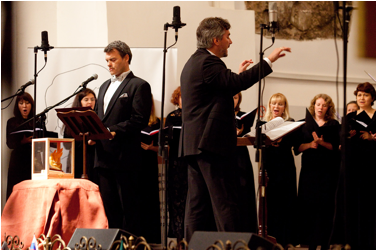 The Moscow Synodal Choir "LIVE"
The Synodal Choir, one of the oldest professional choirs in Russia, was founded in Moscow in 1721. The members of the Synodal Choir were mainly from the Patriarchal Choir of singing deacons, which emerged in the 16th century. Initially the Patriarchal choir singers included only male clergy. Until the middle of the 17th century, the singing was monophonic, but later the choir began to perform polyphonic songs with children's voices becoming included (sopranos and altos). After the abolition of the patriarchate in 1700, the choir became known as a "cathedral" one and was attached to the Dormition Cathedral of the Kremlin. Following the establishment of the Holy Synod in 1721, it was transferred to its department, re-dubbed "Synodal". During the 17th and 18th centuries, patriarchal singers, and later the Synodal Choir were in parallel and competed in level and mastery of performance with court singing deacons, renamed the Court Chapel under Peter I and transferred to St. Petersburg. Choristers from the Cathedral of Christ the Saviour, the Church of the Exaltation of the cross, the Church of St. George, St. Nicholas Nunnery, Church of the Nativity of the Blessed Virgin Mary, the Church of the Archangel Gabriel and others also take part in the joint choir of the Kaliningrad diocese. At the turn of the 19th and 20th centuries, the choir repertoire had expanded to include secular music and variations of Russian folk songs. 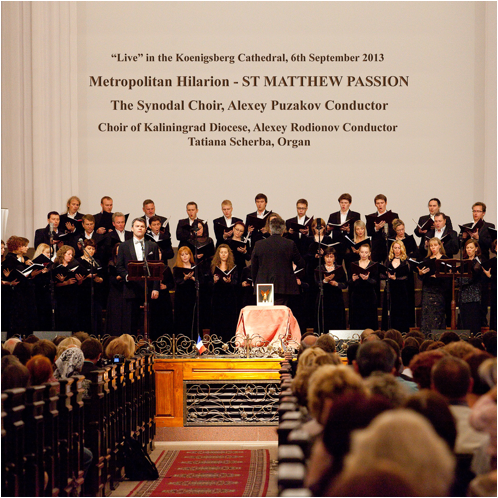 Many Moscow composers wrote specifically for the Synodal Choir. Pyotr Ilyich Tchaikovsky was actively engaged in the choir's activities in his day. In 1917 after the restoration of the patriarchate in Russia, the choir had preserved its name which by then had become historical. At the Easter of 1919, the Kremlin cathedrals were closed, the Synodal College was dissolved, and the choir ceased to exist. The present-day Moscow Synodal Choir, began its revival in the spring of 2009, with the appointment of Metropolitan Hilarion of Volokolamsk, the rector of the Joy of All Who Sorrow Church. The Synodal Choir is being revived on the basis of the choir of the joy of All Who Sorrow Church on Bolshaya Ordynka Street in Moscow, where since 1948 the traditions of Moscow church school of singing was preserved under the direction of the choir director Nikolai Matveyev. A number of recordings of Russian religious music were produced and published over the course of several years, under N. Matveyev's supervision. Alexei Puzakov became one of the directors of the All Who Sorrow Church. After the death of N. Matveyev in 1993, many of the traditions laid down by him were discontinued; the choir music library was lost and the choir was greatly discontinued; becoming a chamber singing ensemble. BAM 2056 � & ℗ Bel Air Music - 11/2013 All Rights Reserved.